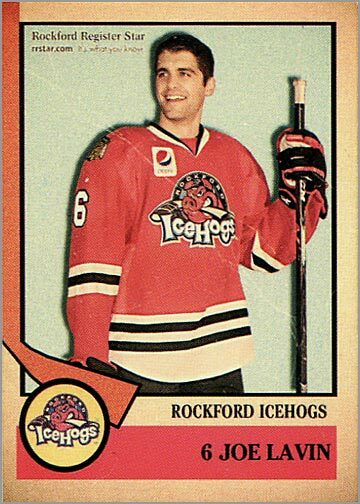 The 2012-13 Rockford IceHogs team set might just be the greatest minor league team set ever made. 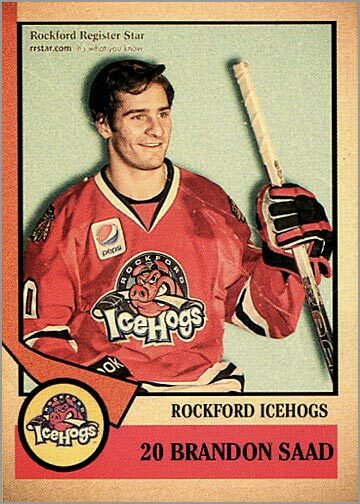 Consider the cool, retro design that pays homage to old time cards and the plethora of NHL talent included, and you’d be hard pressed to find a more worthwhile team set of minor league players. A good minor league team set is as comprehensive as possible, and this set is no exception. Twenty five players and three coaches have cards. 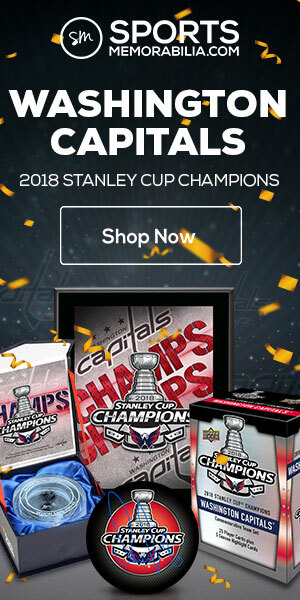 Pretty much every regular who was with the team when this set was made is represented. 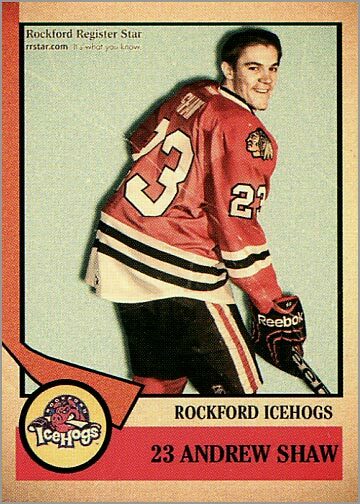 But what makes this set stand out is the number of NHL regulars on the IceHogs who were demoted due to the lockout. 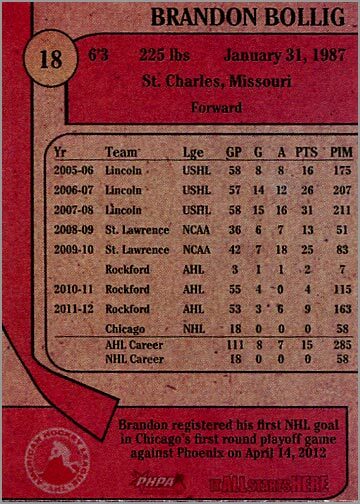 Here you can find cards of Nick Leddy, Marcus Kruger, Calder Trophy finalist Brandon Saad and fan-favorite Andrew Shaw. 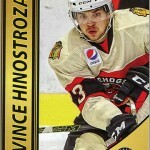 Many minor league team sets look alike these days. This is because they are produced by a company called Choice Marketing, who does nice work but tends to rely heavily on using the same templates over and over. 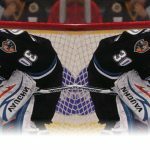 Other teams may opt to go with an original design for their team sets, created in-house but paid for by a sponsor. The result is usually a garish product logo — buy some Gatorade, kids! — on the front of the card, ruining the design. 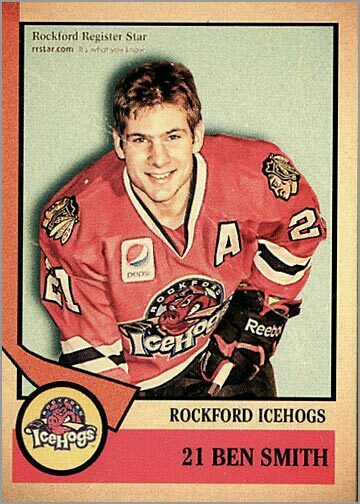 Thankfully, the IceHogs took a different approach and got the best of both worlds in the process. The design of these cards plays off of the 1974-75 Topps and O-Pee-Chee sets. At first glance, you may think this is a straight-up copy, until you see the old and new cards side-by-side. 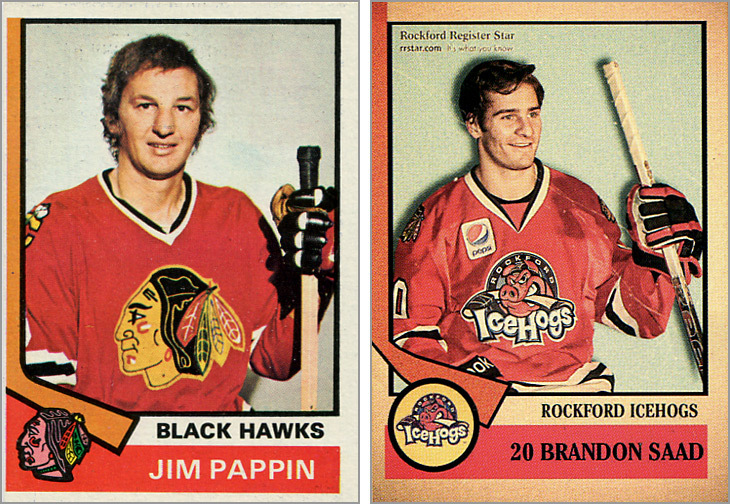 A 1974-75 Topps card (left) and a 2012-13 Rockford IceHogs card (right). Also consider the brown-tinged borders, very similar in tone to old Parkhurst cards from the 1950s and 1960s. 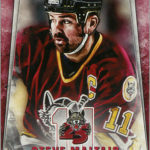 The cards even lack gloss on the front, giving them the “papery” feel of old trading cards. 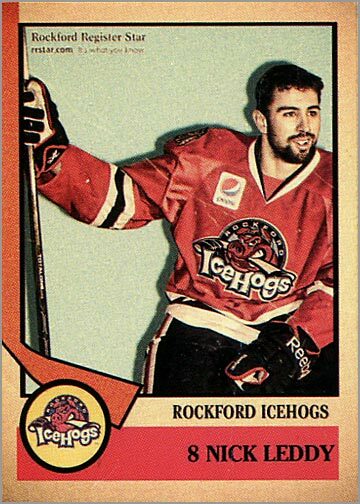 One touch that should not be overlooked is the understated sponsorship logo of the Rockford Register Star newspaper, neatly tucked into the corner — much like the old Topps or O-Pee-Chee logos used on cards in the 1980s. I am grateful to the Register Star for sponsoring such a wonderful set, and not insisting on sullying it with a distracting logo that would kill the design and spoil the mood. I’m so grateful, in fact, that I think everyone should visit their website and read one of their articles, just as a way of saying thanks for sponsoring such a neat set. 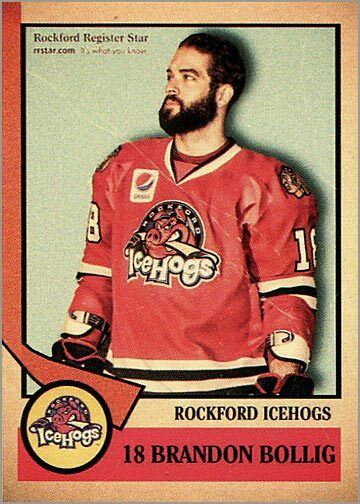 And whatever graphic artist in Rockford put this design together obviously understood that it takes more than just copying an old design in order to make a good set of vintage-looking cards. Providing stats on minor league cards is a challenge because of the number of leagues a player might play in. 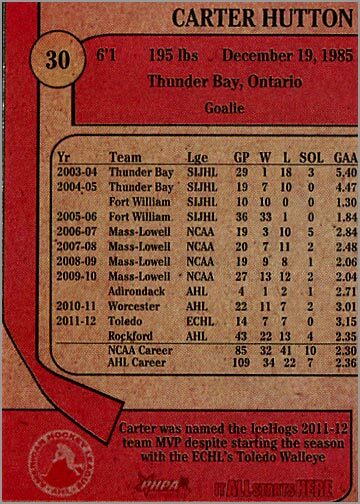 Whereas an NHL card needs to reflect just NHL stats, a good minor league card should have a player’s stats from that player’s various leagues — including college or junior hockey, the NHL and other minor leagues. 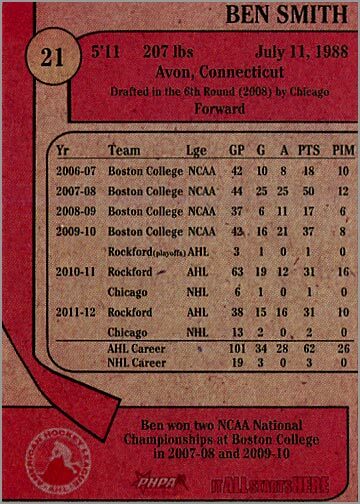 These give you an idea of where the player has been, and his potential career trajectory. This becomes an even bigger problem when you consider that many of these players may split a season with two or more teams. 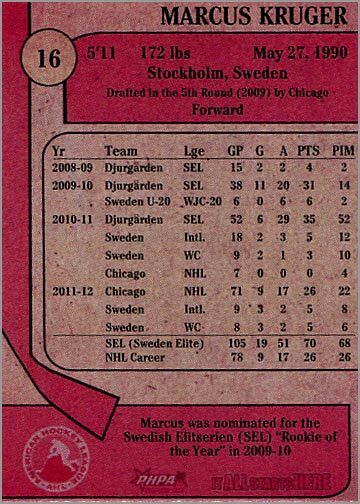 Marcus Kruger spent the 2010-11 season with four different teams, including international play. 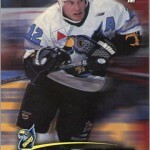 Wade Brookbank split the 2003-04 season between two NHL teams and three AHL teams. All stats from all leagues are reflected on these cards — albeit, sometimes very small to fit everything in. And it all fits in — even with the intentionally off-centered printing. 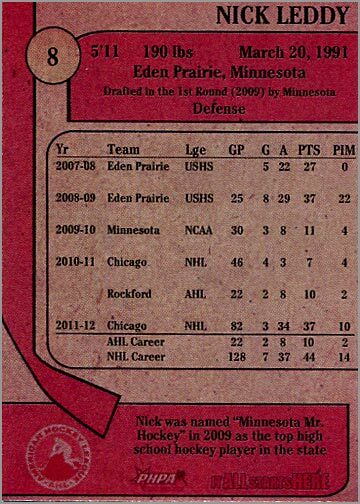 One other nice touch is that the backs are printed in red and black ink on brown card stock, furthering the old time hockey look. Too hard to read, you say? Tough luck, kid. 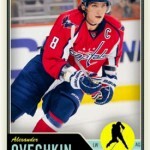 Back in my day, hockey cards were grainy and hard to read — and we liked it! 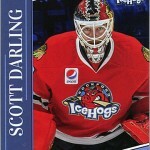 The 28-card team set was given away at the IceHogs’ game on January 26, 2013. 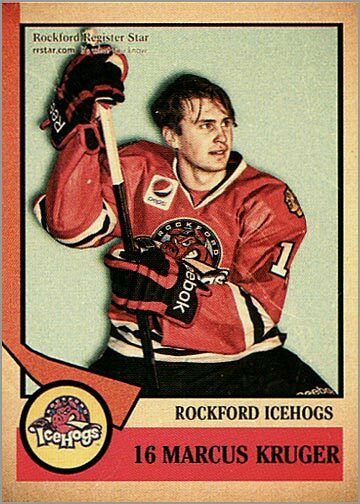 It was available through their team store for $10 during the season, and can currently be purchased through the IceHogs online store for $15. Is my score a bit biased in my assessment because I like the Chicago Blackhawks? Probably. But you cannot deny how good these cards look. Plus, factor in that five of these guys are NHL regulars, and another five are poised to make the NHL soon. 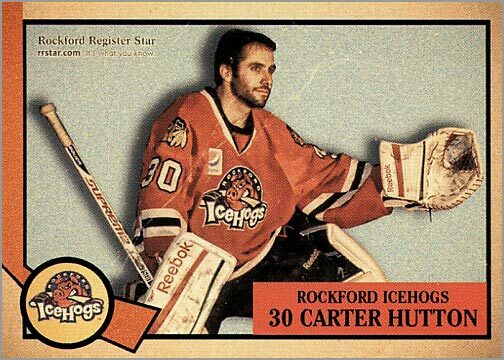 Any serious minor league collector, Blackhawks fan, or those who like offbeat cards should get this set now. 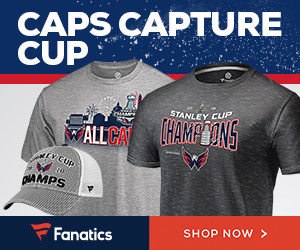 Here are six players who won the 2013 Stanley Cup Championship with the Chicago Blackhawks. 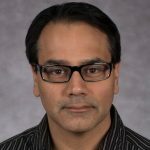 Terrific article! Thanks so much! Glad you enjoyed it, Irv. Awesome cards, though i overpaid for some of the cards I bought on ebay not knowing how cheap the whole set was. Great Brookbank reference to that crazy season where he was traded a bunch of times.